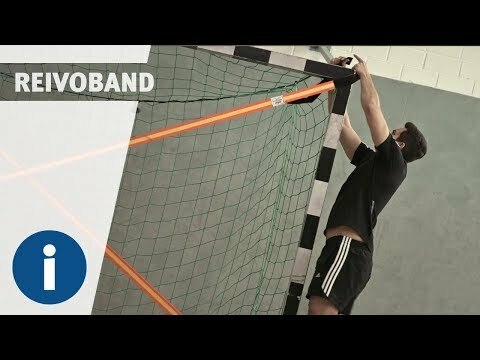 The Reivo "Plus" Band has many uses and is especially suited to ball games, group games or as a replacement net. The Reivo "Plus" band is very popular with schools and clubs. With just one band, you can develop strength, speed and endurance. High-quality workmanship without any metal or hard plastic parts, ensures this band is great for children and teens to use and takes away any fears they may have. A huge bonus of this flexible band is its quick-release system. Even more Reivo bands can be attached to either end of the band allowing it to be extended, e.g to use across large sports halls. The Reivo "Plus" band is extremely versatile and flexible. It can be used as a net replacement or for ball and team games and offers a great variety of uses. Schools like to use the band as a substitute for a badminton or volleyball net. Its benefit: many children can play on only one net, which will save you set-up time. Our tip: Why not order the Reivo belt at the same time? We recommend this for people with a larger waist. A truly versatile band – the Reivo "Plus" band from Sport-Thieme.